Air Malta warned in a judicial protest today that it may have to permanently stop operations if a threatened pilots' strike goes ahead. In a judicial protest filed against the Association of Airline Pilots (ALPA), the airline said that should its flights be stopped by the strike, it would incur enormous costs and there would be a clear and imminent danger of it having to stop operations. ALPA has said it will decide by Wednesday whether to go ahead with the strike on Saturday. Some 57 pilots are expected to be dismissed as part of the airline restructuring - which will see a total of 511 staff members lose their job. The pilots insist that there are many other measures which the airline may take to reduce costs. The airline insisted that the threatened industrial action was not legitimate since the association had not registered an industrial dispute and its claims - made in the media - did not constitute a dispute in terms of the law on industrial relations. Furthermore such claims could not be accepted by the airline, other than that it was already in talks to change contracts for services. The airline pointed out that it was undergoing restructuring at a time when its survival and the jobs of all its employees were in danger. Should the strike go ahead, this danger would become imminent. The airline also insisted that it was respecting its obligations in terms of the law. The airline warned that should it collapse, the consequences would ripple far beyond the company. The actions being threatened by the pilots were without justification, that were disproportionate and would endanger the jobs of thousands, the airline said. The airline therefore called on Alpa to desist from calling the strike. 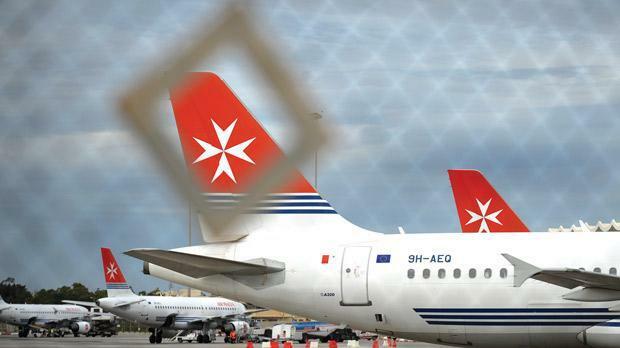 The Association of Airline Engineers (AAE) Malta, in a statement this afternoon, said it is holding talks with Air Malta management aimed at finding solutions to the many problems the company is facing. "These discussions are still at the very earliest stages. The Association has made it clear that it does not believe that dismissing employees can solve the company's problems or make up for bad management decisions in the past". The union said that over the years, one-sided commercial contracts had crippled the airline almost out of existence. "The Association wants to see Air Malta management be proactive and aggressive on renegotiating its commercial contracts and restoring the Company to profitability." The AAE said it would continue to work within the FORUM and with other Air Malta unions to find the best solution for all employees. It said that contrary to reports, no final decision has been taken about joining the pilots' demonstration on Friday. Last Saturday a spokesman for the union told The Sunday Times that members had not authorised the union to participate in the demonstration unless the pilots withdrew the threat to strike.